Welcome to Calvary Chapel Appleton! Calvary Chapel Appleton is a non-denomonational fellowship of believers in the Lordship of Jesus Christ. All are welcome to join us for worship, the simple teaching of God’s Word, and for fellowship in a welcoming atmosphere. Our desire is that you would know Christ and be conformed to His image by the power of the Holy Spirit. Learn more about what we believe or about our history. Join us April 25th-27th for our annual Pastors & Leadership Conference. Our theme this year is By Faith: The Book of Hebrews. Visit the conference page for more information about the conference, or register now on Eventbrite. View the conference schedule. Pre-registration for the conference has now closed, but you may register at the door. The dates for our 2019 trip are October 29th-November 11th. Find out more. Contact the church office to sign up for the trip or to receive updates as the tour approaches. 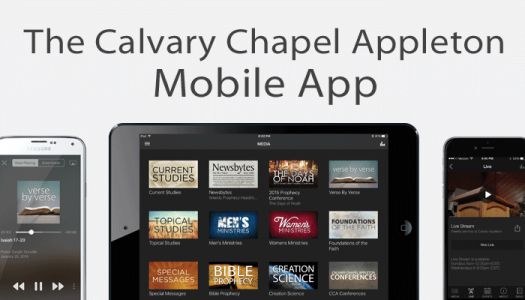 Our free app is available now on your device’s app store. Find out more. Our App is now available for your TV on the Roku and AppleTV platforms. Browse our online media library. Includes current messages, prophecy updates, conference media from Calvary Chapel Appleton and more. Live Stream available during all services.